My perfumes have totally changed now, with the change of season I'm favouring my light fruity floral fragrances. 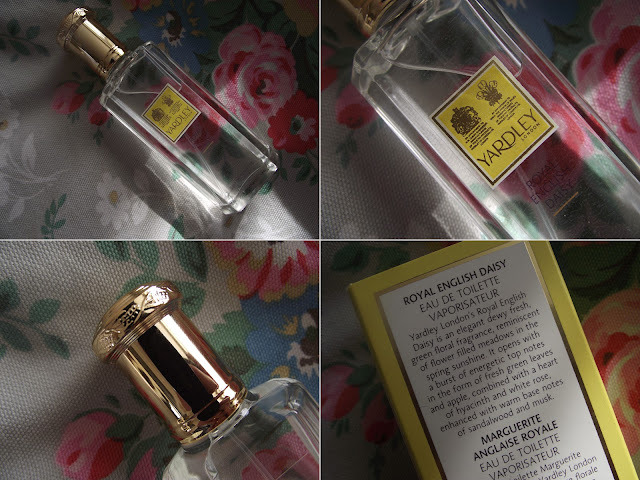 After trying some of the body products from the new Yardley London collection I instantly fell for the Royal English Daisy scent. You can read that review here. I've been using the hand cream lots since and the smell is very reminiscent of Marc Jacobs Eau So fresh which happened to be one of my most loved scents of 2011. So when Royal English Daisy EDT landed on my doorstep I was a very happy bunny you could say. I like the simplicity of the bottle, very traditional and stylish. If you're a fan of fruity florals for the spring & summer this would be perfect for you handbag. I carry mine around in my changing bag. Whilst it doesn't last all day it certainly lingers for a while, this is the perfect day fragrance. An elegant dewy fresh, green floral with top notes of green leaves and apple, a heart of hyacinth and white rose with warm base notes of sandalwood and musk. Don't be fooled into thinking Yardley London is for 'older' folk because it's not, the body collection is lovely. I have the Rose Body Wash and it's lovely on the skin, I recommend their body lotions as well for dry skin. The scents are very subtle but you can truly smell it on the body after use. Yardley London are campaigning this month in conjunction with the launch of their new bath & body collection as I mentioned earlier. The campaign features two models wearing stunning dresses to reflect the new fragrances. The dress are made from white crepe and adorned in silk flowers. Have you tried any of the new range from Yardley London?